SubliJet-R™ is a unique high viscosity gel sublimation ink formulated specifically for the Ricoh® print head. Touting fast printing speeds, high capacity cartridges and a low maintenance design, Ricoh is the business class print engine that offers a new choice in both start-up and high-volume sublimation printing. 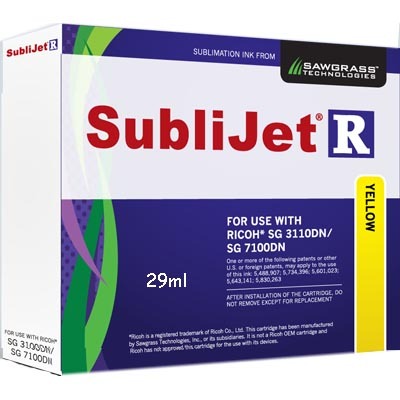 Yellow Cartridge SubliJet-R™ Sawgrass® Sublimation Ink, fits the Ricoh® SG3110DN and SG7100DN GelJet Printers, 29ml Cartridge. The ink collector for the GelJet printers is 405783, sold separately. 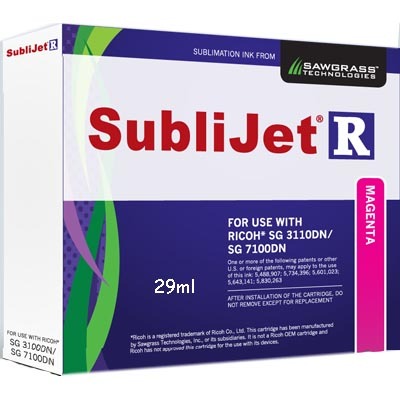 Magenta Cartridge SubliJet-R™ Sawgrass® Sublimation Ink, Magenta, fits the Ricoh® SG3110DN and SG7100DN GelJet Printers, 29ml Cartridge. The ink collector unit for the 3110/7100 printers is 405783, sold separately. Cyan Cartridge SubliJet-R™ Sawgrass® Sublimation Ink, fits the Ricoh® SG3110DN and SG7100DN GelJet Printers, 29ml Cartridge. The ink collector unit for the 3110/7100 printers is 405783, sold separately. Black Cartridge SubliJet-R™ Sawgrass® Sublimation Ink, fits the Ricoh® SG3110DN and SG7100DN GelJet Printers, 42ml Cartridge. The ink collector unit for the 3110/7100 printers is 405783, sold separately.